Hugh John Cairns was the son of Hugh and Sarah Cairns. He was born about 1886 in Coalisland. The 1901 census shows the family living in Coalisland. Hugh was 15 years old and working in a factory. His father was a clerk. By the time of the 1911 census, Hugh’s mother Sarah had died. Hugh was now working as a railway porter. Hugh John enlisted in Cookstown and served with the 2nd Royal Inniskilling Fusiliers. 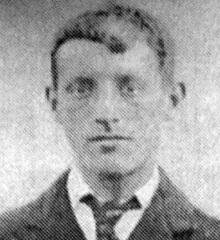 Lance Corporal Hugh John Cairns was killed in action at the Battle of Festubert on 16th May 1915. The CWGC refer to Hugh as 4354 Lance Corporal Hugh John Kearns. This family name is almost certainly spelt incorrectly as both the census and his local church refer to the family as Cairns.